Here at Lakeshore RV Center, we want every customer to own the RV of their dreams. 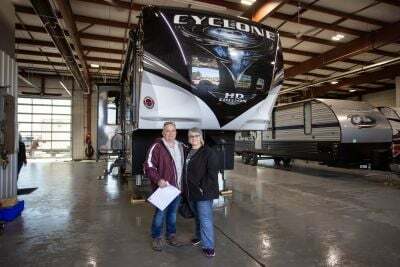 There's no better value than this 2019 Heartland Cyclone 4101! This 5th Wheel Toy Hauler is ready for an outdoor adventure! You'll create lasting family memories in this Cyclone, and we can make it happen. Lakeshore RV Center has the lowest prices and the best financing in Michigan and the entire country! So don't put your dream off any longer. Give us a call at 231-788-2040, or drop in and see us at 4500 E Apple Ave Muskegon Michigan 49442. We're dedicated to making your RV dream come true! The exterior of this dashing RV features a 19' 0" awning, providing some much-needed shade and protection from the elements! You can go further with this RV, which boasts a GVWR of 20000 lbs, a hitch weight of 3630 lbs, and a ship weight of 16845 lbs! Combat the summer heat with the 15000 BTU a/c, or fight the winter cold with the 35000 BTU furnace! 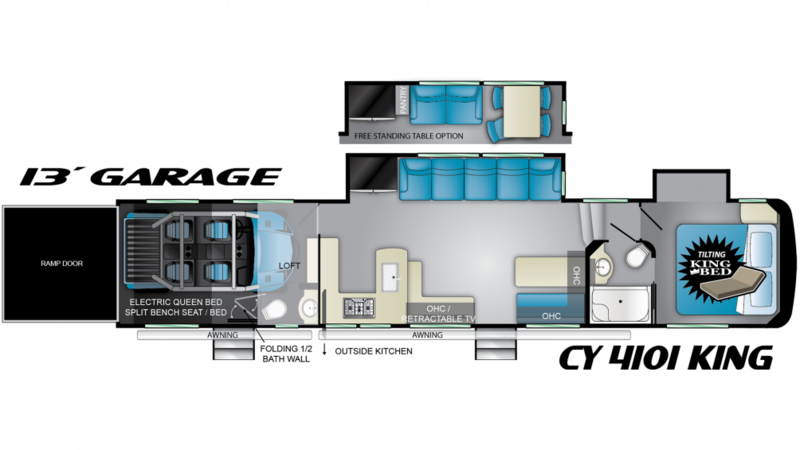 You'll be able to stretch out inside this 44' 0" long, 8' 5" wide RV! There are 2 slides, and the RV has a height of 13' 0"! Your family will sleep soundly in this fantastic 5th Wheel Toy Hauler. It sleeps up to 7 people in comfort. The luxurious King bed in the master bedroom means sound sleeping, or lounging pleasure for reading or just relaxing. Your family will enjoy great meals with the kitchen, which includes a 3 burner cooktop stove and a 18.00 cubic foot refrigerator that will let you stock fresh food, fruits, and veggies! Don't worry about the kitchen running out of water, with the 100 gallon freshwater tank! You'll have the convenience of a shower and a Porcelain Foot Flush toilet wherever you go with this RV's bathroom! With 60 lbs. of LP tank capacity, you'll be able to have long, hot showers every morning! You'll have somewhere hidden to store your waste with the 80 gallon gray water tank and the 80 gallon black water tank! The campground is more fun when you bring your favorite toys! They'll fit nice and easily in the easy-access 13' 0" garage! This toy hauler has an impressive cargo capacity of 3107 lbs, so even your heaviest toys can come with you on your outdoor adventures! 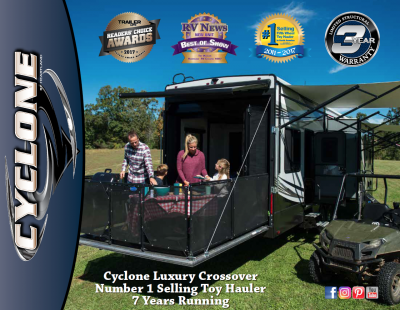 This 2019 Cyclone 5th Wheel Toy Hauler has so much to offer, including a half-bath for convenience and comfort. The Porcelain Foot Flush toilet is easy to use, and with a 80 gallon black water tank, there are no worries! Bring your family, bring your friends, there's room for everyone in this Heartland Cyclone, especially at night when it's time for bed. The loft provides a comfy and warm sleeping space that the kids will love!